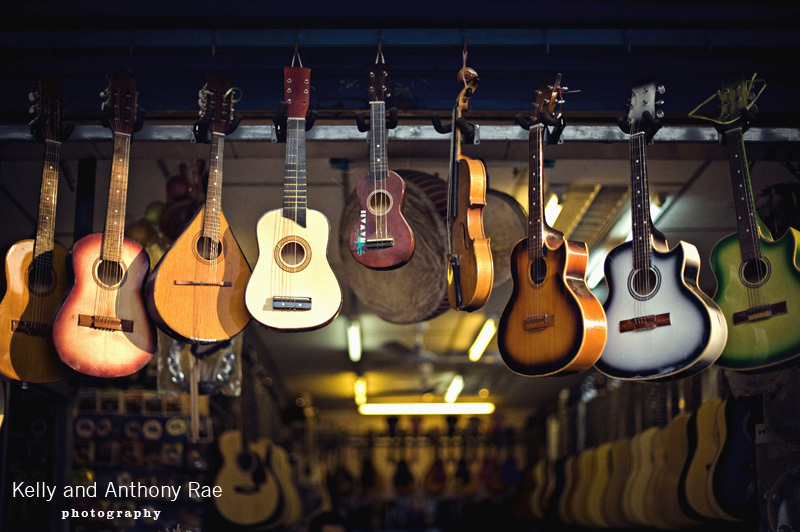 Day 10 photo: guitars and other assorted guitar like instruments hanging in a music shop. The oldest iconographic representation of the guitar is a 3,000 year old carving of a Hittite or ancient Anatolian bard playing the instrument. The modern guitar is believed to have descended from the cithara brought to Hispania by the Romans, in 40 AD. Traditionally, guitars were constructed with combinations of various woods. The strings were made of animal gut. The highest price paid for an electric guitar at auction, was $959,500 at Christie’s in July 2004 for Eric Clapton’s ‘Blackie’ Stratocaster. The previous record was for Grateful Dead’s Jerry Garcia’s custom-made ‘Tiger’ ($957,500 in 2002). The Fender factory makes around 90,000 strings per day. This is over 20,000 miles a year, enough to circle the world. They also make around 950 guitar necks a day! Franz Schubert composed his music on a guitar hung from a hook over his bed, as he couldn’t afford a piano. Berlioz also did his composing on a guitar!